The Big Blue Bin is Local. The Big Blue Bin is Better. 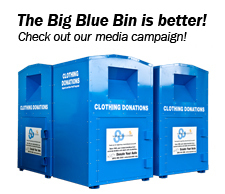 Host The Big Blue Bin™ at your business, and you'll support children and adults with disabilities who live and work near you while also providing a welcome service to people looking to clean their closets and boost their karma - all at no cost to you! Many donation bins around town are in it for the money: they're owned by for-profit businesses, so they sell what you donate to make money for private companies. All donations to The Big Blue Bin benefit Northwest Center, a local, reputable, and registered 501(c)(3) non-profit established in 1965.